It’s supposed to snow tonight and my daughter and I are so excited. Call us crazy, but we love the snow! One of our favorite memories from the two years my daughter was in Ms. (Eleanor) Palm’s class was the annual holiday program where the class recited Stopping By the Woods on a Snowy Evening, by one of our favorite Great Thinkers, Robert Frost. After the program, the parents and kids would all go back to the classroom to create their own snowy woods scene with upside down ice cream cones, white frosting, and lots of imagination. At home, we like to make our gingerbread kits into the house that Robert Frost might have passed on that snowy night, though perhaps his might not have had so many gumdrops. We start with a standard gingerbread kit and add lots and lots of candy (still got some Halloween candy left over? Perfect for this!) Then we look through the pantry and in the back of all the cupboards for anything that would make decorations. The older and staler, the better! We find granola makes a wonderful gravel walkways, old pretzels are great for stacks of wood, crackers are perfect for roof tiles…whatever you find can be put to use. And then there is the “snow” – lots and lots of white frosting, piled high on the roof and dripping off as icing icicles. Since gingerbread kits never come with enough icing for our snowy scenes, so we get an extra jar or make up a batch of royal icing (the kind that turns nice and hard). We then create our snowy woods with upside down ice cream cones covered in lots of icing. Add colored sprinkles and you’ve got colorful Christmas lights.Stacked marshmallows are great for snowmen, especially if they are cut around the top to take away the hard edges. And finally, if we still think we don’t have quite enough snow, we add some chopped up shredded coconut on the ground. 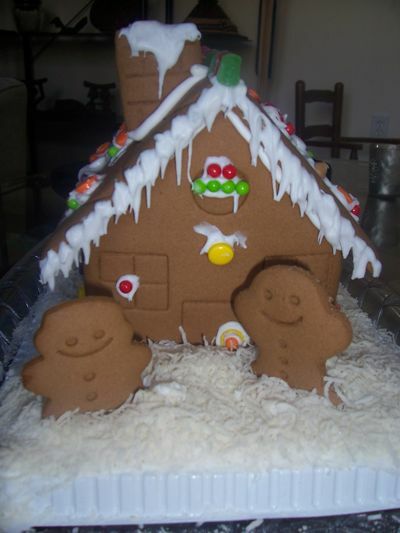 Our favorite part comes after we have finished our gingerbread house. We gather around to admire our just-finished handiwork and recite Frost’s Stopping by the Woods on a Snowy Evening while imagining ourselves walking through those woods and coming upon our snowy candied creation.